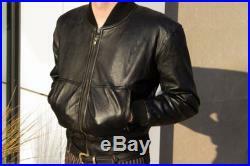 Black leather bomber jack from the 1980s in great condition. Model stats: 5' 9, size 9 shoe, size 30 pants, medium/large shirt. Thanksany other questions, don't hesitate to ask.